California road warriors Y&T have announced a slew of new tour dates for Europe kicking off this month, as well as new 2017 dates for the US, including 2 performances at the legendary Mystic Theater in Petaluma, California in November and performances on the 2017 Monsters Of Rock Cruise. 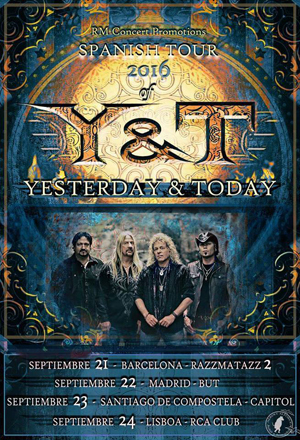 “We know the fans are always asking us to play tunes that we haven't always had the opportunity to play for years; so we decided to work on some cool gems from Y&T's deep catalog of songs to make certain we give you a special and different show from previous years. Because we took some time off this summer, we are especially energized and excited to bring that special Y&T energy, passion, and enjoyment to every single one of these shows. Please come join us--especially now, as the world need the positive energy that we can all make happen together. See you very soon!"